Four Canadian crews fought for podium finishes during the final day of racing in Lucerne, as spectators were spoilt for tight and fierce racing ahead of the all-important 2014 World Rowing Championships in six weeks time. The men’s four were the first Canadians to be on the podium winning the bronze medal in a highly competitive event. The crew of Will Crothers, Rob Gibson, Conlin McCabe and Kai Langerfeld held second place for the first half of the race behind Great Britain, the eventual winners. In the vital third 500m, the Canadians couldn’t quite hold off the Dutch crew who split two seconds faster and then held a one second margin to the finish line. In the very next race, the women’s quadruple sculls crew of Emily Cameron, Kate Goodfellow, Carling Zeeman and Antje Von Seydlitz-Kurzbach returned to the podium receiving the silver medal. After a convincing win in Friday’s heats, the crew started well and were third at the 500m. By the 1000m mark, the Canadians had rowed through the Dutch but couldn’t gain on the Germans which had lead from the start. After the lunch break, Canada’s lightweight women’s double showed their strength and determination, coming from fifth and over four seconds down from the leaders to take bronze in the final stretch. The crew were last at the 500m mark and had only clawed back one position by the 1500m mark. In the final 500m the women split 1:41.980, a full two seconds quicker than the winners, Great Britain. In the final race for the Canadian team, the women’s eight took an early lead and simply pulled away from the field to cross the line with clear water back to the Romanian crew in second. 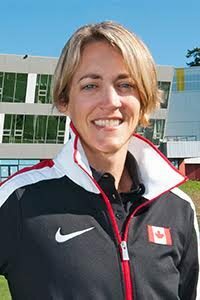 Remarkably, the win was Canada’s veteran coxswain, Leslie Willie-Thompson’s first ever win at Lucerne. Earlier in the day, the women’s pair crew of Jennifer Martin and Kristin Bauder, also members in the women’s wining eight, won the B final ahead of Australia and the Czech Republic. Canada’s Julien Bahain missed out on the A final after Saturday’s highly competitive semi final which was stacked with New Zealand, the Netherlands and Norway, all taking the three spots in the A final. Racing in the B final, Bahain finished in second in yet another tight men’s single race. Results in the other B finals were second in the men’s quadruple sculls; fourth in the lightweight men’s four and the men’s double; and, fifth in the lightweight men’s double scull. The team will now return to Canada for final preparations before the 2014 World Rowing Championships starting on August 24 in Amsterdam, Netherlands.